All the guides I’ve taken use white bait mostly that they have netted. I have some near shore numbers that I can sabiki up some pilchards and the odd pin fish. I’m NOT good with 6’ cast net and I don’t think it would do much from a boat anyway. Some people have said a big shrimp is as good as a pilchard...I have my doubts. There is something exciting about having a pilchard getting nervous at the end of your line ! How hard is it and how early in the am do you need to go out and net pilchards when/if they are around ? 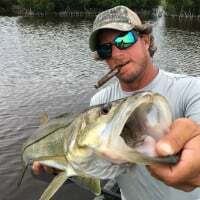 Is a big ole shrimp a comparable bait for snook and reds fished under a cork close to mangroves ? Chomping at the bit waiting for this wind storm to come through and get out fishing hopefully the weekend or early next week. probably wondering why no one has responded yet and thats because what anyone says may come off as mean and no one wants to be mean but ill try to be helpful best i can without hurting anyones feelings. buddy forget the offshore bait it takes a while to get that down. a 6 ft net is good for shallow and if you dont own a 10 footer because you cant throw one well you should just look at other ways to fish. practice getting bait on beaches and flats first and by bait i dont mean strictly pilchards. make sure you dont pass up the opportunity for mullet and finger mullet. That being said Shrimp is a good way to catch Snook but not as productive no doubt. Ive been very successful for 33 years in various regions throwing shrimp and DOA shrimp for Snook and Reds. tear em up! I almost strictly fish offshore wrecks and piles out of Choko. occasionally I'll push my boat into deeper river mouths. If I don't bring bait from here( lauderdale), I like to get to one of my spots pre-dawn. I can catch them after sun up, just a little harder. I have no problem sabiking up bait. You can also use a mini chicken rig with hair hooks for pin fish. learn to throw a large net . there are many tutorials on line. practice in your yard. You'll get it. Sometimes the net won't work and you'll have to use a sabiki rig. keep trying. Snooks will eat small grunts, lady fish, etc. I've had them eat mangrove snappers on my line. Don't limit yourself to strictly pilchards. Good luck. Dont over look cut bait either. Those lady fish come in handy! Appreciate the straight forward advice !